Gloria is a 61-year-old woman who was admitted to Jupiter Rehabilitation and Healthcare Center, with diagnoses of COPD (chronic obstructive pulmonary disease) and hypertension. 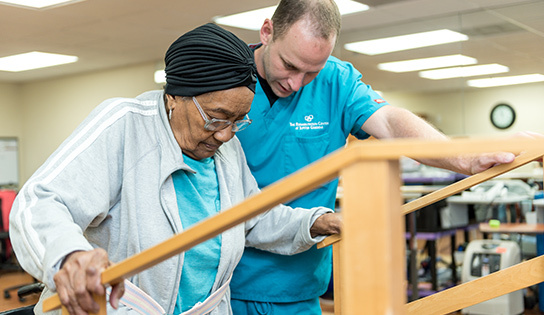 At the time of evaluation, Gloria showed weakness of her lower extremities with decreased balance and required moderate assistance from sit to stand and while ambulating to the bathroom. After three and a half weeks of intensive physical and occupational therapy, Gloria showed significant progress in all functional levels. Today, Gloria is preparing to return home. With hard work from herself and the team at Jupiter, Gloria is now independent while walking around the facility with a rolling walker and is also able to maneuver her rolling walker around obstacles. Gloria is able to dress herself and transfer independently. She is also independent with her home exercise program. Gloria was extremely motivated during therapy sessions, which overall assisted her to reach her goal to now be able to leave our facility in a better state compared to her condition upon admission!